I like your videos! I like the engine bar protectors, I like your other video too! I f. Love Kawasaki! Enjoy your videos, looking forward to more z900 topics. 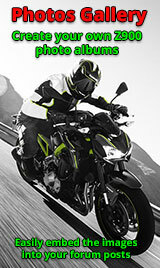 Keep the z900 videos coming. Its what brought me to your channel. I agree about the engine bar protectors, that is a very smart idea to have those! I don’t want my crankcase busted leaking oil from a accident or accidental drop! I hope to get some soon! Also some of those fender extenders. Thanks for showing these on your video Matt.